Fall is coming, and with it, colder temperatures will make an unwelcome return, which means two things: some will be complaining miserably about the cold, and others will be dreaming about their snowbird getaway. Fortunately, if you’re looking for some fall RV inspiration and ideas, our latest editorial has you covered. 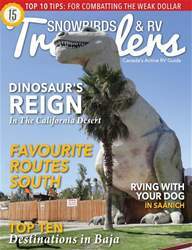 In this issue we have some new locales and destinations that are sure to inspire your next trip. Begin with our feature story on our favourite routes south - we’ve highlighted six notable stops to enhance the journey. Have you ever spent time underground? Dennis Begin brings us a story on the Colossal Cave, an historical legend, where you can take an eerie tour in the dark. If you want to climb in something a bit less spooky, make sure to visit the giant dinosaurs that loom in the California desert. If this is your first time RVing - we’ve got a great tech article on how exactly you can get that trailer hooked up properly. September is also a great time to pick up all the basics for your RV, and our team has selected the best parts, accessories and camping products to help you with those decisions. If you are travelling to the US this fall, read about how to stretch your dollars a bit further than you thought. Wherever you go, we hope you’ll share - tell us more about you by sending us a photo, writing an email or visiting us online. See page 78 for more information.